Anyone who read my article a couple of weeks ago will know that I recently signed up with Netflix. I still believe that the cinema is the best place to watch a film, the larger the screen the better. For this reason I still visit the cinema an average of twice a week. It will therefore come as no surprise that I watch more TV than movies on Netfix. 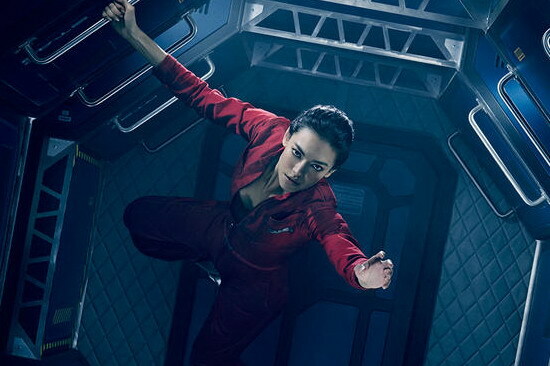 I have mainly been catching up on shows that I have been keen to see for some time but not gotten around to, however, I have just watched The Expanse based on the robotic recommendation of Netflix. Chrisjen Avasarala (Shohreh Aghdashloo): UN Assistant Undersecretary of Executive Administration who becomes personally involved in events. Joe Miller (Thomas Jane): an archetypal heavy drinking police detective on Ceres who is given an assignment that he isn’t supposed to solve. 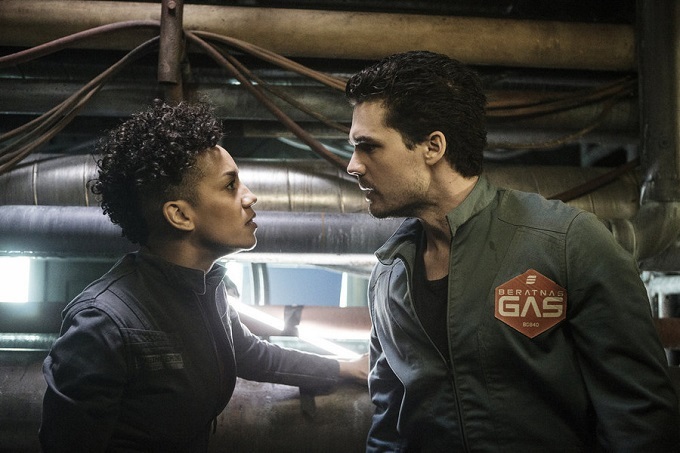 Jim Holden (Steven Strait): an officer on an ice haulage ship who fall down a rabbit-hole that begins when he answers a distress call. The opening credits have elements of The Man in the High Castle and Game of Thrones lending an air of familiarity. The show itself is well constructed with great use of time. Rather than relying on simple flashbacks within scenes the narrative moves around within its timeline with the same dexterity as it does within its universe. This is achieved with a mixture of clearly dated and ambiguous variations that work well to keep the drama tense. The story is similarly well constructed keeping an air of uncertainty and excitement. Many of them main characters are well rounded and developed with believable histories, they are however, largely clichéd and unoriginal. The acting is solid and natural without any wooden or over the top performances, however, on the other hand it lacks any of the standout performances that we can expect on modern TV shows. It clearly doesn’t have the budget of a cinema movie or top TV show but the effects really aren’t bad and largely, it actually looks good. The costumes are a little hit and miss with the space set elements using an effective mix of military uniforms and industrial overalls. The planet based characters fall into most of the same clichés of other similar shows. 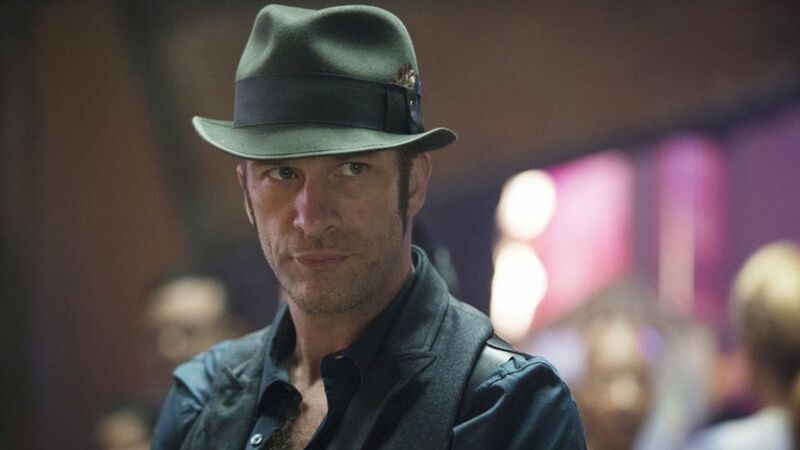 The biggest visual problem though, is Thomas Jane’s haircut. Both too flamboyant and high maintenance for the deadbeat character he plays, but more significantly, it looks stupid. The vehicles and planets have a sense of believably and reality as we have seen in Battlestar Galactica and Firefly. It also shares a dirty industrial look of these shows. 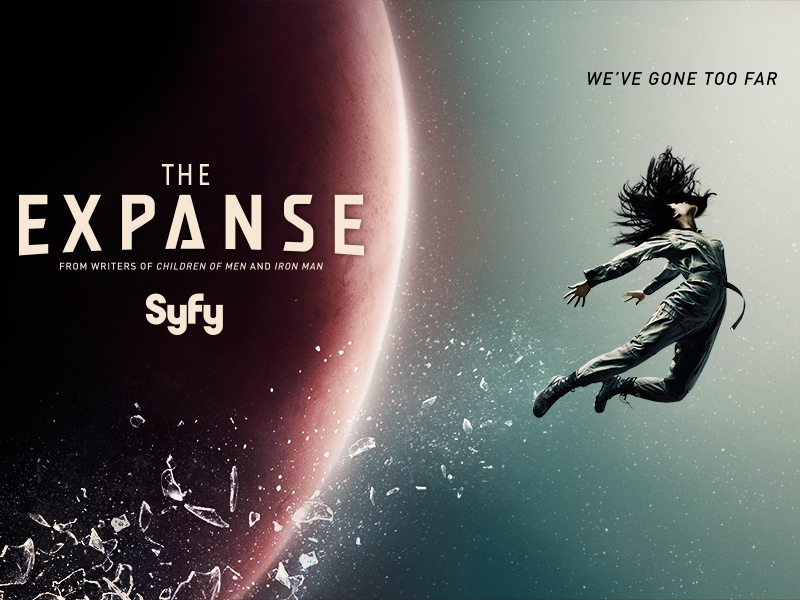 It isn’t a classic show within the genre that we will be seeing alongside Battlestar Galactica and Game of Thrones on best of lists, but it does have both a charm and quality making it worth a recommendation. I am looking forward to season two. I think the Marvel Cinematic Universe AKA The MCU has finally found its feet and its place, on the small screen. A credible interpretation of Marvel comics on screen began in 1998 with Blade, but the MCU as we know it really got going with Iron Man in 1998. Next year will see their two biggest heroes, Steve Rogers / Captain America and Tony Stark / Iron Man go toe to toe in Captain America: Civil War. The film will probably make a billion dollars, as will their kiss and make up, bury the hatchet movie Avengers: Infinity War – Part I, two years later. But, putting all the hugely successful movies aside, Marvel have found their place on TV, or to be more precise online, or video on demand if you prefer. Netflix and Amazon are rapidly gaining credibility as both produces and distributors of quality television, and one of them (Netflix) has done it in partnership with Marvel. This should come as no great surprise. Television has the same ability to serialise as story as comic books. This is something I have limited experience of. Comic books weren’t on my radar as a kid, I read a few as a student in my late teens and early twenties. Despite this I understand the way stories developed over time and appeared in multiple issues making it necessary to follow more than one title to get the whole story. Interestingly things don’t always work exactly that way with Netflix (and Amazon with their products) dropping a whole season in on go encouraging binge watching. So what has prompted this revelation? I have just finished watching Jessica Jones. Thirteen episodes in eight days, I haven’t taken my time, but also don’t think I have binged! I have to say the series has been nothing short of fantastic, but before I get onto that, a little background. Jessica Jones is the fourth MCU TV show. Agents of S.H.I.E.L.D. started in 2013 and has been a little up sand down in the quality of the story. It found its feet towards the end of the first season, into the second, but ended looking like a setup for an Inhumans spinoff. Agent Carter picks up the story of Peggy Carter (Hayley Atwell) after the war, and after the events of Captain America: The First Avenger (2011). It includes in the main cast Howard Stark played by Dominic Cooper, also reprising his role from Captain America: The First Avenger. The show succeeds thanks to some good stories, great period production design and an outstanding performance from Hayley Atwell in the title role. I always enjoyed the movie Daredevil (2003), although it has its problems, I don’t consider it bad enough to call it a guilty pleasure; however, the TV sets the bad a lot higher. Matt Murdock has the same back story, as the comic book. He is blinded and gains his heightened senses allowing him to become Daredevil in same way but after that we have Christopher Nolan Batman sense of realism. Jessica Jones has the most interesting concept. Rather than an origin story for a super hero, it is the picks up after a failed attempt to become a hero. Filled with pity, self loathing and an unhealthy intake of bourbon Jessica Jones is keeping her head down and finding her way as a New York private investigator for reasons that unfold in the early episodes. Next year Jessica Jones will be joining Daredevil (a link is made in the final episode), Luke Cage (who is introduced in Jessica Jones) and the as yet to be introduced (as far as I am aware) Iron Fist in The Defenders. A show that promises to be a small screen version of The Avengers. It has also been suggested that the characters may find their way into the cinematic side of the universe in future. I often praise films over television for the ability to use imagination overcome constraints, usually time, but it works the other way. Most Marvel movies end with the heroes battling an adversary whose threat hangs above a major city (usually literally) and ends in a victory but only after great destruction and collateral damage. The television shows have a different constraint, budget so have to fall back on storytelling and character development to deliver a finale. Lets hope The Defenders continues the quality of Daredevil and Jessica Jones and doesn’t become a cut price Avengers the way Agents of S.H.I.E.L.D. looked like it may go in its early days. But there is also another reason why the TV shows work so well, villains. Agents of S.H.I.E.L.D. and Agent Carter both revolve around the hunt for their true villain, Jessica Jones and Daredevil both have great villains. There are two notable things about Daredevil’s adversary, Wilson Fisk aka The Kingpin, firstly the character seems to truly believe that he is the hero and not the villain and his actions are for good not evil, secondly, Vincent D’Onofrio’s portrayal of him is totally phenomenal. I understand that in the comic books, Jessica Jones’ advisory Kilgrave was featured mainly as a Daredevil villain. Like Fisk he is brilliantly played by (former Doctor Who) David Tennant. The brilliance of the character is the realisation that he isn’t evil for the sake, or the fun of it, he has been turned evil by his ability. With the ability to compel anyone to do whatever he asks, no one will ever love, or even like him for who he is. Furthermore, he can never have a conversation without carefully choosing his words through fear of giving a command. There is also an interesting leaning towards female characters in the TV shows. Three of the four shows are led by woman (Chloe Bennet’s Skye is as much the main character as Clark Gregg’s Phil Coulson in Agents of S.H.I.E.L.D.). Despite the fact Scarlett Johansson’s Natasha Romanoff / Black Widow is the most interesting character in the movies she is yet to get her own movie. As things stand we have to wait until 2019 for a female lead charter, this will feature the yet to be introduced Carol Danvers aka Captain Marvel. I am not suggesting the TV shows are better than the movies but at this moment they are more interesting than the movies and I am looking forward to the further adventures of Jones, Murdock and Carter more than any of the eleven planned movies in the MCU phase three.